Drop cookies, as the name suggests, are baked by dropping or pushing spoonfuls of cookie dough onto the baking sheet. During baking, the mounds of dough flatten and spread. Dough varies in texture from quite soft to stiff. Some fall easily from the spoon and flatten into wafers in baking. Stiffer dough must be pushed with a finger, spoon, or spatula onto the pan. Chocolate chip cookies, oatmeal cookies, and macaroons are just a few cookies that are made by dropping dough onto a baking sheet. Drop cookie dough is spooned directly from the mixing bowl onto the cookie sheet. Change the size of the finished cookie by using less or more dough. For smaller cookies, use a teaspoon. For medium-sized cookies, use a tablespoon; for giant cookies, shape the dough with an ice-cream scoop. Adjust the baking time accordingly for size, adding a minute or two for larger sizes. Drop the same amount of dough for each tray of cookie. 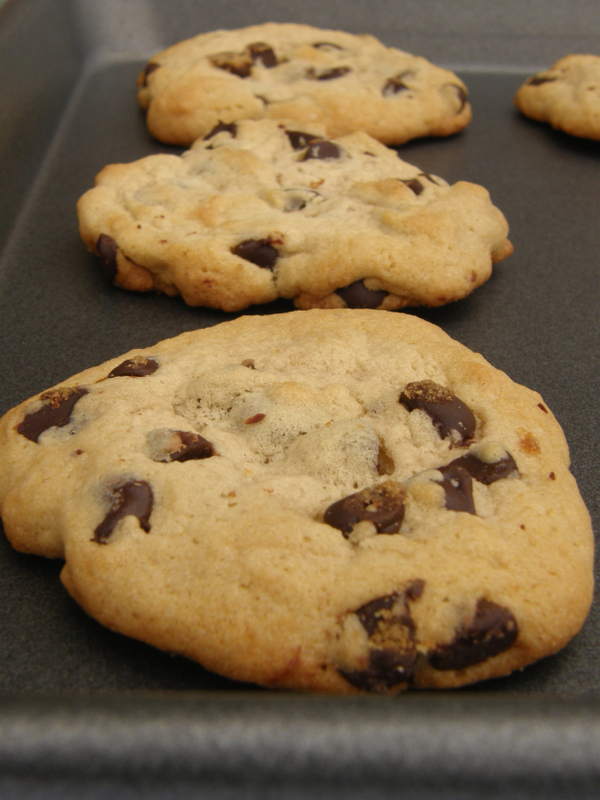 A uniform size allows cookies to bake evenly. Unless the recipe states otherwise, place cookie dough at least 2 inches apart on baking sheep to allow room for spreading. Why do my drop cookies spread and thin out while baking? In order to see if this is a problem for you, bake a test cookie or two before baking the entire batch. This step is particularly helpful when you’re trying a new drop cookie recipe, but also a good idea to try even when you’re preparing a recipe you have used for years, since each batch of cookies and baking conditions are unique. If the dough spreads too much, consider these variables. If cookies are spreading too much, refrigeration helps chill the butter and other fats within the dough. This should reduce spreading while the cookies bake. Scrape down the side of the bowl before chilling the dough. Cover and refrigerate the dough 30 to 60 minutes before baking and try another test bake. Don't grease the cookie sheet unless the recipe calls for it. Make sure baking pans are cool, as warm pans will allow dough to begin spreading before cookies are placed in the oven. Check the label on your granulated sugar bag. Use pure cane sugar (sucrose) where granulated sugar is indicated, rather than a sugar substitute (fructose) or a blend. Use butter, regular margarine, or shortening, rather than a low-fat margarine, diet spread, or vegetable-oil spread. Butter and margarine are 20% water. Low-fat spreads have a higher moisture content (up to 60% water) and will make cookie dough very soft. Substitute shortening instead of butter, as butter melts faster than solid shortening. Even 1/2 butter and 1/2 shortening will melt more slowly than using butter only. Another tip: when mixing dough, use butter that is still slightly firm. Butter that is too soft allows cookies to spread too much. Over-mixing the dough also softens the butter, causing the cookies to spread. Flour can affect how cookies bake and behave. Unbleached all-purpose flour allows the most even spread on cookies. Bleached or chlorinated flours reduce spread. Flours with high protein content (bread flour and all-purpose flour) produce cookies that tend to be flatter, darker, and crispier than their counterparts made with cake or pastry flour. If substituting chunky ingredients, replace with an equal amount of the other ingredient – for example, substitute 1 cup of raisins with 1 cup of nuts. Nuts are usually coarsely chopped. To make firmer dough, chop nuts more finely. When mixing dough, add chunky ingredients (such as nuts, raisins, or chocolate chips) last. Mix just briefly after adding so ingredients are not chopped too finely by the mixer. Better yet, mix them in with a wooden spoon. Scrape the bowl frequently while portioning the dough onto the cookie sheets to ensure an even distribution of chips, nuts, and fruits for each cookie.